The HERITAGE line of flatware by Liberty Tabletop is positioned to set the standard for fine bridal quality flatware. Providing superior value, the forks, spoons and serving pieces are made from the finest 18-10 stainless to ensure decades of luster. The knives are also hollow handle design. Finished to the highest quality standard. 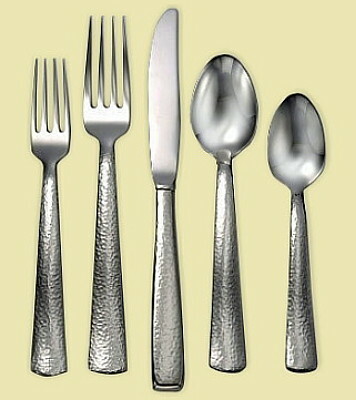 The Pinehurst pattern, with its very popular hammered design, has elegant style and versatility. These pieces bring heavy weight and balance to your home. Pinehurst is a popular pattern that looks striking on wooden tables and even works with vintage table top settings. ALL Liberty Tabletop 18-10 Stainless Flatware is manufactured in upstate New York entirely of USA materials! *PLEASE NOTE: Any combination of items over $100 ordered from Liberty SHIP FREE and we waive shipping charges when we charge your credit card.